The Laser design rights have reverted back to Bruce Kirby from Global Sailing. And Bruce hopes to work to get the builders back on track and resolve the dispute that arose around these design rights. It remains to be seen whether this really does resolve the issue, but best of luck to Bruce. 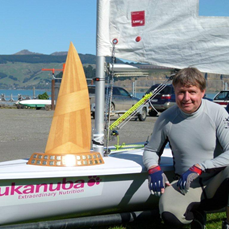 Our own Canterbury Master Radial Sailor Hamish Atkinson has won the 2010/2011 Mader Trust Canterbury dinghy sailor of the year, and gone on to win the major trophy of Mander Trust Canterbury Yachtie of the year. 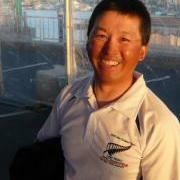 Nice job Hamish - great to have a Laser sailor winning overall. 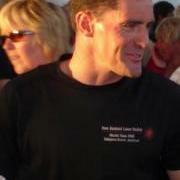 Andy Maloney won 5 of 9 races for a clear win at the 2011 Cork OCR regatta in Kingston Canada. He 8 net points clear of 2nd place Chris Dold (CAN) and 19 point ahead of Andys travelling partner Clay Dold (USA). 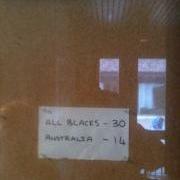 He had no races outside the top 10 in the 47 boat fleet at the ISAF Grade 1 event. Andys trip continues on to San Francisco for some training before the Perth Worlds at the end of the year. The 2011 Laser Masters Worlds has finished up in San Francisco with New Zealanders Scott Leith and Ed Tam first and second in the Apprentice Radials, and James Quinn and Mark Page also getting cubes. The Masters were hosted by a very up market but friendly and well organised St Francis Yacht club on the city shoreline between the CBD and the Golden Gate Bridge. Naturally the backdrop was stunning. But while the sailors enjoyed the famous San Francisco sea breeze it was really all about the tide. With a 9 and 2 on the penultimate day Andrew Murdoch lead into the final days medal race at the Olympic test event in Weymouth, just one point ahead of Australian Tom Slingsby. But the double points format meant a 7th in the medal race dropped Andrew to 4th behind Tom Slingsby, Rutger van Scaardenburg and Paul Goodison. A frustrating end for Andrew, but his performance across the regatta looks like it's just where he wants it a year out from the Olympics. Sara Winther finished 22nd in the radial. Sailing a Laser on the last day of the Laser 4.7 Worlds was a bit like hitting yourself on the head with a hammer ......it felt so good when you stopped! This Postcard comes by way of Munich as we head for the Splash Worlds in Czech.